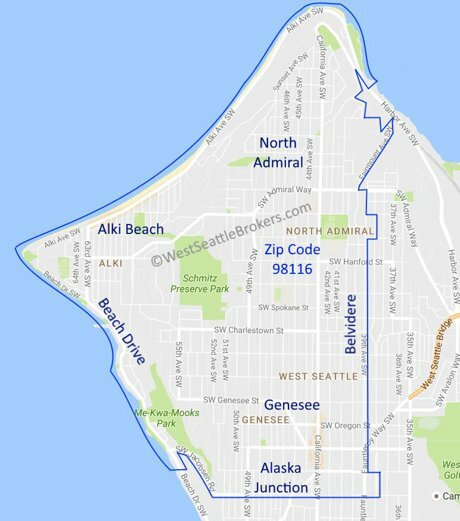 The North Admiral area is one of the original historic neighborhoods in West Seattle. The streets are mostly flat for easy strolling. Many of the original bluff side homes were owned by sea captains, so they could view their ships in the harbor from their homes. The streets are beautifully tree lined and the homes are generally of high value, which makes the area one of the more expensive neighborhoods on average in West Seattle. Shopping and restaurants at the Admiral Junction include Metropolitan Market and Circa eatery. Recreational offerings are had at Hiawatha Park with its tennis courts, track, and kid's play areas. North Admiral is also home to the West Seattle branch of the Seattle Public Library. The area also calls home to West Seattle High School and Lafayette Elementary School. One of the best known areas in West Seattle is scenic Alki Beach. Some call it the Venice Beach of Seattle, with its long walking path, many restaurants, and expansive sandy beach. It's often a hub of activity in the summer with roller bladers, sunbathers, volleyball tournaments, you name it... but fairly quiet the rest of the year. 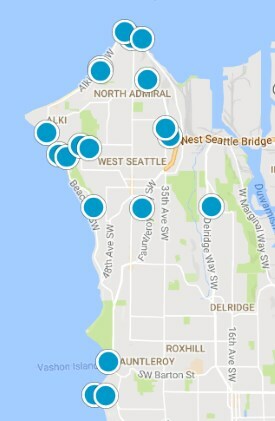 Local eateries line Alki Ave - you can get fresh ice cream at Pepperdocks, fish and chips at Spuds, and pizza at Pegasus. More formal restaurants include Cactus and Phoenicia. If you follow the paved path to the east, you can enjoy iconic views of Seattle and hop on the Water Taxi, which zips across Elliott Bay between Alki and downtown Seattle. The west side of Beach Drive consists of waterfront homes, and on the east side of Beach Drive the homes are built on up the hill to take advantage of the amazing Puget Sound views. Alki Beach is just a walk or a short bike ride away, or ride your bike south all the way to wonderful Lincoln Park. Walking is common here, and there are several smaller public access spots to get to the water and view the sea life in the tide pools. The quiet residential street Belvidere Avenue runs north and south right down the middle of this quiet neighborhood with period homes and overhanging trees. Many homes enjoy sweeping views of downtown Seattle. The streets are gently sloping but still easily walkable. The northern section is an easy stroll to the Admiral Junction with its great grocery stores and schools, and the southern section is close to the Alaska Junction with its many shopping and dining options. The area of Genesee is best thought of as going east to west, and it begins on the west side of California Avenue. Portions of it are a bit hilly, as these are where there are some beautiful water view homes, and other sections are fairly level. Genesee has a mixture of period homes and mid-century homes. Some of the older smaller homes are being replaced by new moderns. There is a brand new elementary school in the neighborhood. Genesee is a great area to look for a home that may be nearly in its original state, or one that has been completely remodeled. The eastern section is close to the Alaska Junction shopping and mass transit.